I am drinking a nice, fruity Riesling, ironing a crease in my lederhosen, humming along to the sultry stylings of the “Riesling Lounge: Smooth Vibes for a Lovely Atmosphere” while cabbage boils and the bratwurst sizzles in the pan. If this vision of loveliness conforms to your view of Riesling drinkers, then you might be one of the many who profess not to like the noble grape. Your complaints about Riesling? “It’s too sweet”, you opine. Too sweet? Sure, if you haven’t tried a Riesling since the halcyon days of the late 1970s and early ’80s when “fur sure” your hair was big, you wore leg warmers and Blue Nun was your wine of choice. Don’t be ashamed. We all drank it. However, in the late ’80s things began to change – German consumers began to demand dryer wines, even though the first wave of trocken (dry) Rieslings might best be described as less than desirable. 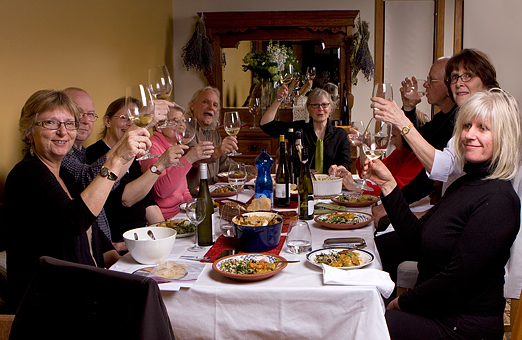 Every six weeks, five Okanagan Valley wine drinkers get together in Summerland to enjoy a variable smorgasbord of victuals and blind taste BC wines. The group consists of Kathy Malone, winemaker at Hillside Winery, Ron Watkins, founder and former owner of Dirty Laundry Winery, yours truly, together with John Gordon, co-owners of Valentine Farm and The Vinegar Works, and Stephanie Seaton. Any number of special guests are thrown into the mix for added enthusiasm. The latest challenge was with guest-judge Paul Jones from The Vanilla Pod; there were eight unidentified Rieslings and eleven wine drinkers of diverse origins. While driving to the tasting venue, it occurred to me that Riesling features in a number of songs and so by my reasoning it follows that song writers must be Riesling drinkers. Listening to the lyrics of Carl Hauck’s song ‘Martial Riesling’ – “We were buzzed on martial Riesling and an ever growing feeling that we possibly were onto something worth another glass. So, we poured it and drank the bottle dry” proves my point. Of all the grapes of Germany, the most noble is the Riesling. Between 60% and 65% of the world’s Riesling vineyards are in Germany. Originating in the Rhine Valley some six centuries ago, it now thrives in dozens of niches all over the world including the Okanagan Valley. Riesling grapes do well in stoney soils and are quite drought and frost tolerant which makes it suitable for the Okanagan. 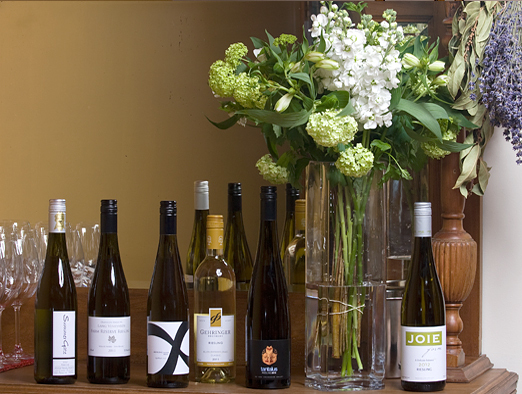 Riesling produces elegant wines with plenty of acidity and a range of aromatics. Delicate. Fruity. In the Okanagan Valley, a few determined wine producers are making Rieslings with due care and attention. The biggest hurdle is convincing the wine drinking public to embrace their own inner Riesling. Riesling is not the one dimensional acid bomb they think it is – it should be taken out of the fridge more often. It is not just for sandal-clad, summer dress wearing young women on steamy, afternoons. Complex and cool Riesling is equally suitable for winter imbibing. 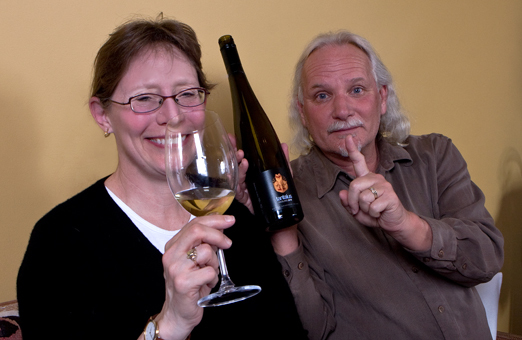 It is very food friendly and German Rieslings, in particular, have a legendary aging potential. The tasting was a raucous affair with much lively discussion. Consensus was that the overall quality of all eight Rieslings was very good with one garnering the most praise and being rated as truly exceptional; the Tantalus Vineyards 2010 Riesling is a standout, clear with a pale straw colour. The bouquet is layered with apple and citrus notes of lemon and lime. Also apparent are notes of linden flowers, nutmeg and a subtle minerality. It is astringent and lively. It has good weight and balance with a nice, long finish. Very enjoyable indeed. It sells for $22.90. Another crowd-pleaser was the Lang Vineyards 2011 Farm Reserve Riesling which sells for $19.99. Ron Watkins, upon tasting the Lang Riesling stated, “Now that’s what I call a Riesling.” That says it all except that this Riesling has notes of lime and grapefruit, with a hint of flint and a very smooth finish. Where is BC in the Riesling market? I stumbled upon the International Riesling Federation website whose mission is to raise the profile of the world’s Rieslings. I followed their interactive map where you can pinpoint the Riesling regions of the world: Washington, Ontario, Austria, Alsace, Australia, New Zealand, Germany, South Africa, New York, Michigan, Oregon, California. Hello? Where is British Columbia? 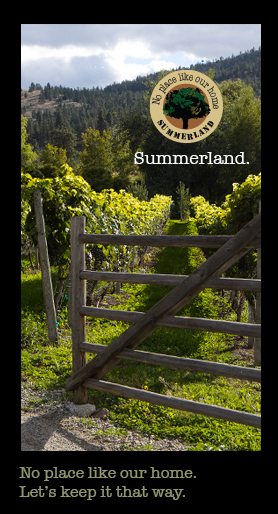 I think it is time to raise the profile of this underrated grape in British Columbia. At the very least, get it on the map. We need to get out there and preach the gospel of Riesling. Amen to that. 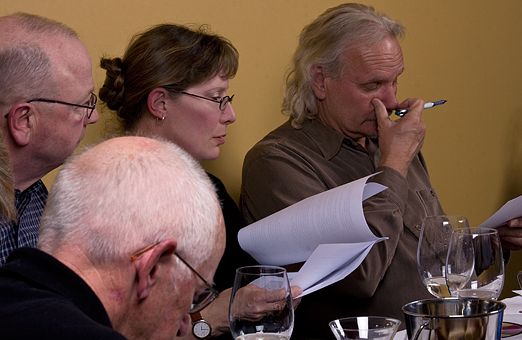 Kathy Malone of Hillside Winery, Ron Watkins founder of Dirty Laundry Winery, and guest judge Paul Jones, owner of The Vanilla Pod Restaurant, for being on our Sidebar Wine Tasting panel. Barbara Thorburn for being our gracious ‘guest server’. Art Knapp’s Plantland and Flower Shop for the flowers – won for a second time in a row by Kathy Malone. Aya Eyewear – for the lovely door prizes. Summerland Waterfront Resort for supplying accommodation to our out-of-town judges – at their lovely hotel on the lake. Love this Kim! Fun article and looks like a great evening!